I have a few pairs of these loose fitting jersey trousers now and have been loving them on warmer days where I want to opt for something a little more relaxed. They’re basically my answer to joggers, as I always like to stay a bit smart even if I’m just nipping to the shops. 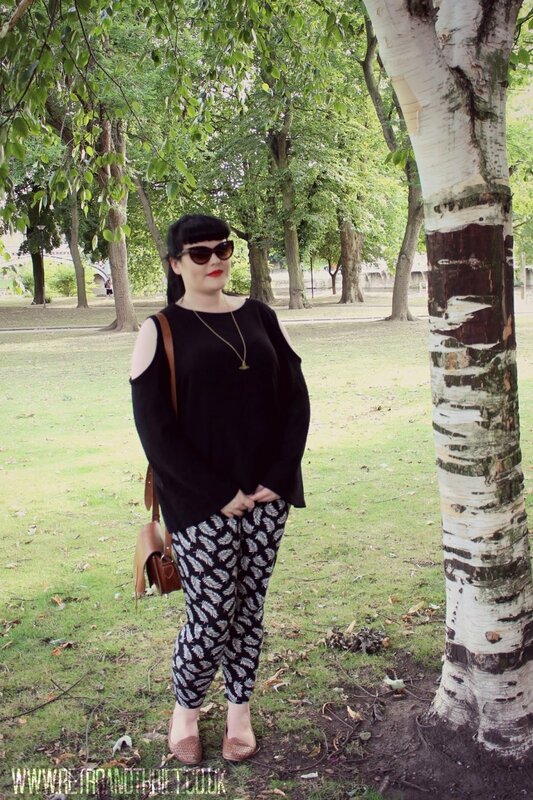 Here I have paired the patterned pants with a cold shoulder jumper, also from H&M. However I have also sported t-shirts and vest tops with the comfortable leg wear. They’re elasticated waist has been a godsend for me whilst battling post-graduate weight and adjusting to a new work/life balance after leaving the student bubble. Meanwhile, the relaxed fit on the leg makes them cool enough for summer days without me having to resort to shorts. I think they’ll be ideal for the transition between summer and autumn, a time of year I always look forward to. I’m a sucker for over-sized jumpers and scarves! In the meantime, however, I have paired this outfit with some cat-eye sunnies, ballet shoes and my thin lines flat orb necklace from Vivienne Westwood. What's your go-to high street chain? Let me know in the comments below!